I can’t believe it’s been almost FOUR months since I’ve had a Sammich Saturday post! I know I’ve had sandwiches of some sort on the menu for the past couple of months, but they are either repeats or have gotten pushed back a week, then another week, and so on. I’m happy though, that for the re-introduction of Sammich Saturday, I have something a little different but very yummy to share with you!! A few weeks back when I made the Brie & Brisket Tacos, I had this sammich planned to make to use up the rest of the brie. And then it didn’t happen. But I couldn’t let much time pass without making it, because it sounded too good. And after church on Sundays, I like to have something quick to prepare because J is usually starving. Panini take all of 5 minutes to fix and he loves them. This one was no exception. I know he thinks that some of the food I put in front of him looks weird and he’s probably a little scared sometimes, but he’s gracious and tries it anyway. And fortunately, with the exception of one lentil debacle, he seems to always like what I’ve made. I do recommend using a hearty bread – I used regular wheat bread and the marmalade seeped through a little bit and made that side of the sammich a little sticky. A heartier bread should eliminate that issue. They were delicious nonetheless. 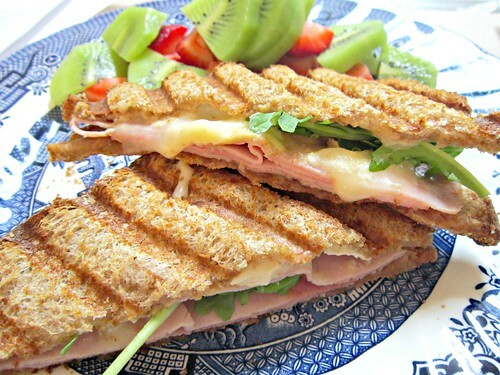 The sweet marmalade, tangy Dijon, and creamy brie went great together with the ham and arugula. I will definitely be making these again. Maybe even this weekend!! Spread 1 teaspoon of mustard onto two slices of the bread, and top with three slices of brie, four slices of ham and a little black pepper. On the remaining two slices of bread, spread 1 tablespoon of marmalade and place one on top of each sandwich. When finished cooking, remove the tops of each sandwich and add 1/4 cup arugula on top. Press bread back down on top of arugula, cut in half, and serve warm. Ham and brie are delicious, especially with marmalade for sweetness! This sandwich looks good!